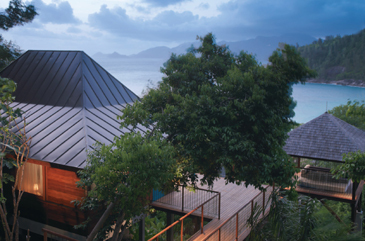 Four Seasons hotels and resorts opens its newest resort in Seychelles: a remote, hillside retreat on the southwest coast of Mahé. The resort is the fourth addition to a collection of Four Seasons resorts on the Indian Ocean, which includes properties in Mauritius (opened in the fall of 2008) and two in the Maldives. The capital of the Seychelles, Mahé is the largest of the Republic's 115 tropical islands, situated off the coast of Kenya and northeast of Madagascar. Embracing the natural simplicity of treetop living, Four Seasons resort Seychelles features 67 secluded villas and suites arranged high on stilts amongst the tropical canopy, overlooking the private, white sandy bay of Petite Anse (Little Cove). "The resort feels like a private island," explains general manager, Markus Iseli. "Our location in Petite Anse is one of the Republic's best kept secrets: a sandy horseshoe punctuated by lush vegetation and impressive boulders to create an intimate haven of intimacy and serenity." The resort is designed to showcase the island's culture and Creole heritage. The hilltop spa offers traditional Seychellois therapies and incorporates indigenous practices and ingredients -such as lemongrass, frangipani and cinnamon- into customized treatments. The Aldabra function room is located within the tropical jungle and the resort's exclusive wedding venue, Foumba ('old house' in Creole) is located within the atmospheric ruins of a traditional Creole house, open to the stars. 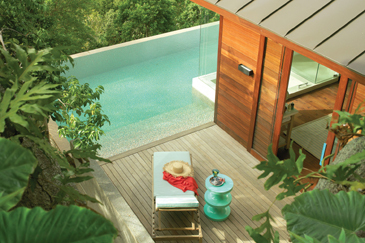 Standard villa features include large infinity-edge plunge pool, open-air shower, glass-walled bathroom and expansive, private outdoor living space. Sunset views across the Indian Ocean or the resort's lush, tropical surrounds create a sense of complete escapism. The resort also includes 28 Four Seasons private residences within its 170 acre expanse. At the base of the resort, the Bay of Petite Anse exists as an unspoilt image of beachside perfection: black granite boulders, powder-white sand and lush tropical foliage set against the azure blues of the sea and sky. Other facilities include two restaurants and two lounge bars; an outdoor swimming area that combines four pools in one; a water sports pavilion offering snorkelling, swimming, sailing, windsurfing, fishing and boat tours; a comprehensive fitness centre; jogging trail that circles the lagoon and weaves through the gardens; juice bar; hair salon, library; art gallery showcasing local art and sculpture and an entertaining and educational programme for children featuring 'play and spray' pool, play area and Kids Club Kaz. Mahé offers easy access to the Seychelles' many sights and attractions including Vallée de Mai -once believed to be the original site of the Garden of Eden- and the Aldabra Atoll, original home of the Aldabra Giant Tortoise, with over 150,000 still in residence. Tennis, trekking, hiking, bird watching, mountain biking, paragliding, golf, barbeque boat trips to neighbouring islands and deep -sea fishing can all be booked through the resort's Concierge. Four Seasons is dedicated to perfecting the travel experience through continuous innovation and the highest standards of hospitality. From elegant surroundings of the finest quality, to caring, highly personalised 24 -hour service, Four Seasons embodies a true home away from home for those who know and appreciate the best. The deeply instilled Four Seasons culture is personified in its employees -people who share a single focus and are inspired to offer great service. Founded in 1960, Four Seasons has followed a targeted course of expansion, opening hotels in major city centres and desirable resort destinations around the world. Currently with 83 hotels in 35 countries, and more than 40 properties under development, Four Seasons will continue to lead the hospitality industry with innovative enhancements, making business travel easier and leisure travel more rewarding. For details or inquiries please contact www.fourseasons.com.